Band of Brothers. "Our transgressions just weren't as interesting as coke and hookers," drummer Larry Mullen Jr. tells SPIN about the band's lack of tabloid press. "Everyone's had their moments, and there are skeletons in the closet, but we've been very lucky. We may . Wallpaper and background images in the U2 club tagged: u2 spin magazine photo shoot band of brothers. 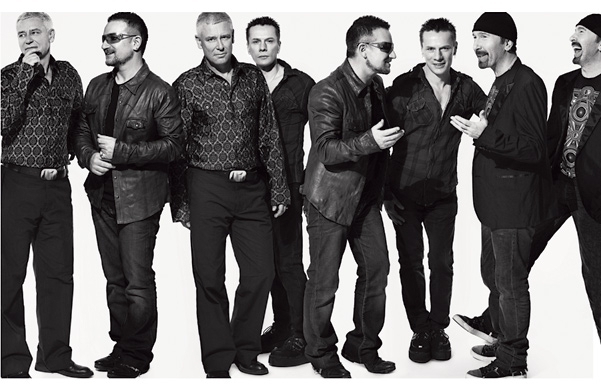 This U2 photo contains business suit, well dressed person, suit, pants suit, pantsuit, suit, and suit of clothes. There might also be three piece suit, slack suit, dress suit, full dress, tailcoat, tail coat, tails, white tie, and white tie and tails.